The impoverished Pacific nation bought the cars to ferry around VIPs attending the Asia-Pacific Economic Cooperation summit in November. The International Criminal Court has been given harrowing accounts at two Pacific island camps, where refugees are detained indeterminately. 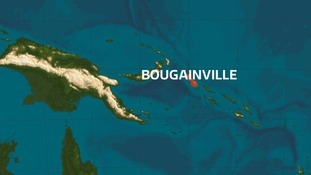 An earthquake of magnitude 7.9 has struck west of Arawa on Bougainville island, Papua New Guinea. An advisory from the Pacific Tsunami Warning Centre said that widespread tsunami waves were "possible" following the quake. The US Geological Survey, which said the earthquake struck at a depth of 167 kilometers (103 miles), downgraded the quake from its initial measurement of magnitude 8. The Pacific Tsunami Warning Centre said widespread tsunami waves were possible following the 8.0 magnitude quake. An aggressive species of fish which can survive on land for days has been caught on camera as experts fear it could be headed for Australia. Tourists on a sightseeing boat tour in Papua New Guinea got more than they bargained for when a volcano erupted right in front of them. An earthquake with a magnitude 7.8 has been recorded off Papua New Guinea, the US Geological Survey said. The Pacific Tsunami Warning Center has said a tsunami warning was in effect for Papua New Guinea and the Solomon Islands after the earlier earthquake. A magnitude 6.7 earthquake has struck off Papua New Guinea's north coast city of Lae, the United States Geological Survey said. The quake, about 150 km (95 miles) east of Lae, was initially recorded at a depth of about 20 km, although that figure was later revised to 87 km. The Pacific Tsunami Warning Centre said there was no Pacific-wide tsunami threat.